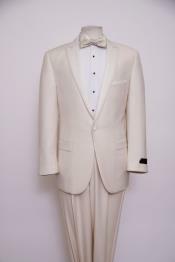 Ivory tuxedos are often used at formal weddings for a slightly more elegant look than the standard white tux. 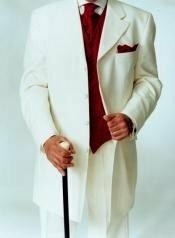 We carry ivory tuxedos and jackets in a variety of styles including two buttons and three button single breasted tuxedo suits. 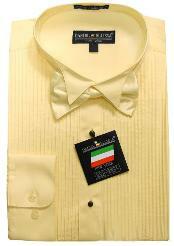 We also carry mandarin collars, fashion tuxedos and zoot suit styles. There is something to fit every personality and event in our collection. 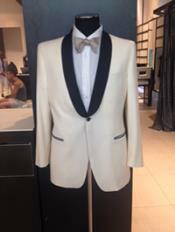 Our new introduction is ivory and black tuxedo which is already selling like hot cake. Ivory tuxedos are ideal for weddings, if you want to choose an ivory tuxedo with a black lapel then you have a great taste for tuxedos. Ivory is one of the preferred colors for bride grooms. We have specially made groom tuxedos. Buy with confidence. Other available colors with ivory combination are white, black, cream and more. 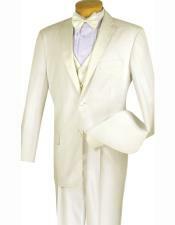 The style of ivory tuxedos you may choose to wear depends on a few factors. One is your personality. Men who prefer conservative styles are more likely to select a traditional style for their tux. 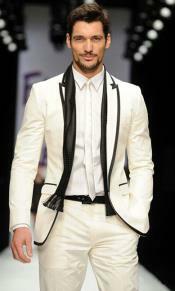 Trendy men who love fashion may choose a fashion tux, mandarin collar or zoot suit style. Another consideration is the event where the tux will be worn. Some events are more open to trendy or unusual styles than others. Your role in the event is another factor to consider. For example, if it is your wedding, the theme and location of the ceremony may be a factor. If you are a guest, you have more options in the style of tux you choose. 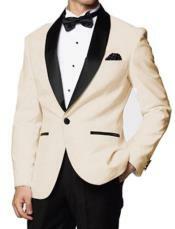 Ivory tuxedos are an elegant and sophisticated choice, regardless of the style you prefer. 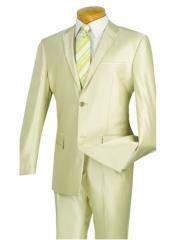 When you shop for ivory tuxedos with Men's USA, you will get great quality at very reasonable prices. 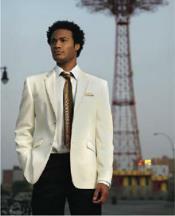 Our tuxedos are of comparable quality to top designers such as Hugo Boss, Canali and Armani. The difference is the price. We offer excellent quality at a great value. We are so sure you will be happy with your purchase that we guarantee your satisfaction.